The Shell Motor Lubricating A5 Notebook provides 50 pages of ruled 80gsm quality white unprinted offset paper, wirobound in a 300gsm front and back card. 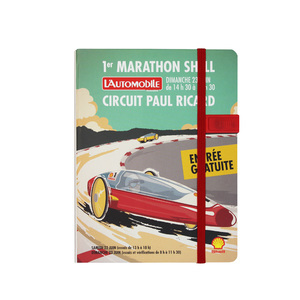 The notebook features a classic Shell art collection print in heritage Shell red and yellow. The perfect combo: A5 vibrant red PU notebook with a metal stylus pen neatly tucked away in the cover. Featuring the Shell V-Power logo, it holds 160 pages of 80g/m2.